This is the UK based gardening business guide where you’ll find step-by-step guidance for gardening. Gardening is a great industry to involve in it because the unpredictable British weather isn’t enough to counter your desire to work outside. Entrepreneurs are in a brilliant position to start a successful business with the ease of networking and use of a strong hobby. This guide will help you start up and give you a few tips to getting your name out there if you’ve dreamed of landscaping huge public properties. Also, if you simply want to make a living interacting with people outside of an office, you’ll get the necessary information here. Only the destiny knows, one day you may find yourself at ‘Chelsea Flower Show’, which is the world famous flower show. What are the Steps to Start UK Based Gardening Business? You have to work with the clients so that you can understand what they want from the gardening. Sketch out the plan in short as your clients prefer. Calculate the costs of labor and materials and make sure your plans come in on budget. Work for your client’s estimate. Does UK Based Gardening Business Need any Qualification? Basically, it doesn’t need any formal qualification for you. However, love of the outdoors and a healthy dose of creativity require as the natural perquisites. Moreover, you can take these at an advantage by getting courses available in horticulture and gardening. But, keep in mind, practical experience is most welcomed than qualifications everywhere. So, it could give you the experience you need to forge ahead while finding people and organizations that need volunteer landscapers. UK based gardening business is a seasonal profession at most. Although planning tends to occur in the winter it’s usually, widely available in the summer. Besides, many residential and private clients don’t prefer to have work during their holidays. This is why many gardening business persons income from some other jobs during the winter season. 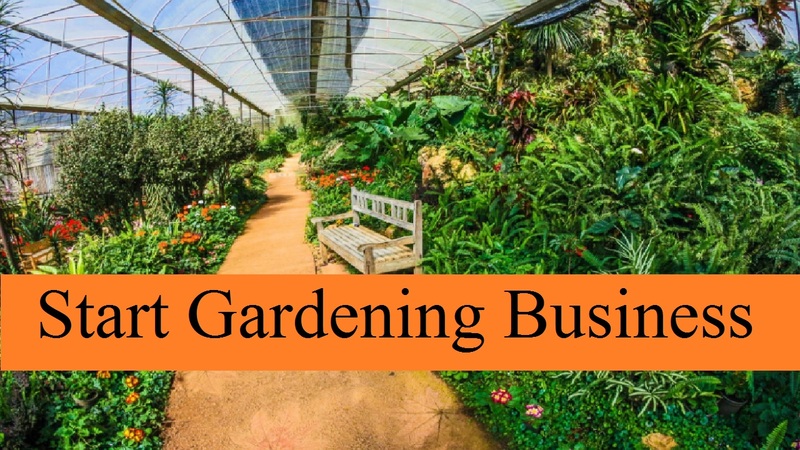 What about the Earnings of Gardening Business? As you already know that the UK based gardening business is nothing but a seasonal job. So, it affects how much you get paid in the summer season. Generally, landscape gardeners set a fixed price for their job. You should factor in what materials you need to get the job done when working out how much to charge. It also depends on how long it will take to finish and how difficult the job is. Although it depends on where they work, self-employed gardeners can charge between £10-25 an hour. But, the rate is higher in London and in the South East commanding. Selecting a legal structure is one of your first steps when setting up a gardening business. This may be the simplest route to choose when many landscape gardeners operate as sole traders. But, if you’re in a partnership, a limited liability partnership then there may be good reasons for setting up a limited company. This is why your choice of legal structure will have an impact down the line, specifically, for paperwork and on accounting. You’ll need to register with HMRC for tax, National Insurance, and possibly VAT before you begin trading. Also, you’ll also need to register for PAYE if you’re employing anyone. As there are fines for those who register late it’s important that you do this promptly. But, keep in mind, you’ll also have to file your tax on time and file an annual Self Assessment tax return. In the UK based gardening business, insurance is a key consideration for every new business. As it covers you against claims arising from injury or damage suffering by a member of the public, you can start with public liability insurance. But, employers’ liability insurance is likely a legal requirement if you employ people in your landscaping business. If you need it and don’t have it, you’ll be fined. You’re all set to start your UK based gardening business right now. If you want to find clients, there’s a range of channels you can use. Some landscape or lawn care companies advertise on directories and newspapers. But, it’ll be great to use online marketing to find customers easily. For this, you have to use free tools to build a website for your business. Also, you should register in the ‘Google My Business’ listings. You can use Google AdWords as well as to experiment with your business. But, keep in mind; make sure that you’re offering customers the best possible service because repeat and referred business is the most valuable business. Build a portfolio: It’s one way to get your portfolio while working quickly on multiple projects. It is able to easily demonstrate your skills are the best way to win clients and builds experience. You can update it with images of your work when you have your own website. Build relationships. As it’s said already that repeat and referred business carries top values in any business. So, there is no way to rapport building with your customers. You should be the only choice for the next time when you complete a job. It can supplement your one-off projects if you perform ongoing maintenance work for a number of clients. Build promotional activities: You have to use both offline online and marketing. Also, you can think about flyers, posters, and signs to put them in the appropriate place. If you want to stand above the UK based gardening business, get your qualifications. After that choose your rates well and find your customers in a friendly and accessible style in your own area. Buy the smaller equipment new and see to get your business plan work out. When you’re all set, you’ll get clients at the short time. If you need more assistance, comment/ knock us. We’ll try our best to help you all the way. Till then, Good luck!